When an author enjoys writing the book, the reader can tell. This is usually because the author enjoys something about the setting or the characters. In the case of Margaret Weis’ Soulforge, it is both. Soulforge tells the story of Raistlin Majere, her favorite character in DragonLance, the setting that made her famous. Though DragonLance Chronicles and Legends are sometimes considered classics in the field of fantasy, they are not as popular as in the past. Weis and her coauthor of Chronicles and Legends summarized the series as “a tale of love and friendship set against a backdrop of war.” If that statement alone doesn’t show that the series can be superversive, I don’t know what would. In my opinion, the books coauthored by Weis and Hickman (or written by either) are definitely superversive. They seek to build up the reader and the social order. While the current order on Krynn is not perfect, they know that burning it to the ground is a nonstarter. The stakes are high, epic even, but when the characters make mistakes of character and integrity they pay for them. Two of the characters from Chronicles that brought on the most fanmail and questions about their background were the twins Caramon and Raistlin Majere. That the authoress had fallen in love with Raistlin helped greatly in making Raistlin the complex character he was amongst a party of archetypes (honorable knight, gruff dwarf, sticky-fingered kleptomaniac). While the other characters could be predictable and at times acted out of character to serve the plot (I’m looking at you, Larauna), Raistlin quickly became predictable in his own way—he would always act to further his own goals, even over those of his companions, friends, and brother. The others were good (in the sense of being selfless) to varying extents. Raistlin’s first appearance showed him to be different. Instead of white, he wore red, the color of neutral wizards. He was not good but not evil, either. But this post is not about the Chronicles. It’s about the Soulforge. The Soulforge shines with the care of a true craftsman and artist. The descriptions are vivid but not overwhelming. Margaret Weis takes the time in each scene to make sure you know how everything is laid out in the room. However, she doesn’t spend too much time describing everything. She knows how to use enough description that the reader feels in the scene without being bogged down. Being a prequel to Chronicles, The Soulforge faces one big hurdle—we readers know how it is going to end. Maybe not the specifics, but we know that the brothers are going to come out alive, and because of what is revealed in books written earlier but set later, we know how close of a call it will be for Raistlin. We know going into the book that Raistlin will finish the book alive and a wizard, because that’s how he appears in Chronicles. Even so, just like Vader’s first breath through the mask in Revenge of the Sith, there is a moment everyone knows is coming but still brings a small tear to the eye. Like any prequel, Soulforge has to tell a new story when the ending is already known. Certainly, Weis faces that task and delivers. 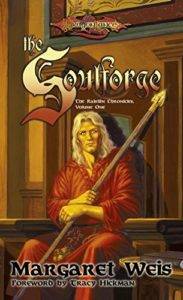 Soulforge covers the life of Raistlin from age six, when he speaks to a wizard for the first time (Antimodes the White, a very powerful wizard) to age 21, when he is officially recognized as a wizard in his own right. There is one drawback to the book covering so many years—there is no big bad to build up. In fact, this was a prediction I got wrong. As I read it, I expected a certain villainess to appear as she was constantly meddling in the other books. To my delight, she was not seen even once! I likewise expected a fellow wizardry student named Jon Farnish to be a major foil to Raistlin, but he never rose beyond annoyance. Raistlin faces many trials and makes several enemies, but there is no one foe behind the problems. The problems are, in fact, related only in that Raistlin and his friends face them. A final note on the crafting of the book comes under the subject of foreshadowing. This is one of the hardest parts of writing for me to do. Because I know how one of my stories will go, I always think that the foreshadowing is too obvious and kills anything further. However, Soulforge lets dribble little pieces of what is ahead that the careful reader will see without destroying the joy a casual reader might experience. The Soulforge tells of the childhood, adolescence, and early adulthood of Raistlin Majere. Born on the magical world of Krynn to a mother with innate but untrained magical talent and a father satisfied with his lot in life as a simple woodcutter, the twins were the classical setup of brains and brawn. Caramon was the big guy, the fighter who lived by his sword. He was also jolly and beloved by the ladies. His twin, however, was dark, brooding, and frail. Sickly, Raistlin lived not by his muscles but by his wits. Caramon cared for him, too much so. Raistlin hated the doting but accepted that he had no other choice. For having no other choice, he hated the sickly body he was born with, cursing the gods for making them two separate people. He felt they were supposed to be one person with a healthy body and brain, but a mistake had split that soul in two. In many ways, he abused Caramon, always calling him stupid and a big oaf. Raistlin was wrong here, Caramon was a slow thinker but by no means slow. Everyone assumed Caramon was an oaf without realising that Caramon took his time to arrive at a solution—almost always the correct solution. As someone describes him in this book, he is a slow thinker but not slow. Raistlin envied Caramon’s easy way of making friends but told himself that he really didn’t need them. The brothers were a very loose definition of co-dependent. Caramon could not function without being needed (a point driven home in Legends where Caramon’s character arc comes to completion). Raistlin needed his brother but hated it at the same time. Both were addicts. Caramon to being needed and Raistlin to the feeling magic gave him. Most fantasy series have a mentor-apprenticeship relationship for their wizards. Some also have a school. Wizards in DragonLance begins with a school and the most promising become apprentices after successfully completing their final Test. The capital T is purposeful. The Test is unique to each wizard and will require all of their skills, both magical and mundane, to complete. It tests not only their power but their personality. When the book opens, Antimodes the White is traveling from his home to meet the head of all wizards, Par Salian, the most powerful white robed wizard in history. To Antimodes’ disappointment, he was given orders to travel overland instead of journeying by the corridors of magic. The reason: to scout for new talent. The head of the order was granted a vision of the future and told by the god of white magic that the world would not survive a coming war unless he, the archmage, found a sword. All the current wizards were solid workmen and would fight if needed, but they had very few war mages. Most people on Krynn distrusted wizards, and few employed them. They needed someone new! Antimodes meets Raistlin in his hometown of Solace and sponsors him at the nearby magical school for boys run by Master Theobald, the epitome of “those who can’t do, teach.” He was assigned to this boys’ school because no one else wanted the job. The school lies along a well-traveled road but is five miles from the nearest town. Most of the students board there. Girls interested in wizardry attend the boarding school for girls in Palanthas, the largest and oldest city in that region. Raistlin quickly showed himself to be the best student in the school and, just as quickly, showed the arrogance that we would see on him in Chronicles. While the other students struggled on the pronunciation of magical words, Raistlin promptly learned to read simple sentences in the language of magic. When they began learning how to scribe scrolls, Raistlin vaulted to the top of the heap with the precision of his handwriting. You see, on Krynn, when a spell is spoken, every syllable and every letter must be pronounced properly. When it is inscribed on a scroll for later use, every letter must be written precisely. Crossing the T too highly or too lowly will invalidate the spell. If even the curl on a Q is wrong, the scroll will fizzle. The students were too young at this point to actually do magic and were forbidden to attempt spells. Raistlin actually obeyed this rule for most of his time at the school. He wanted magic and the only way to get it was to be a good little student. Raistlin never tried to be the teacher’s pet, but his quick mind and obvious talent made him the second-favorite student; had he been nice and a brown noser, he would have easily been favored over Jon Farnish. Raistlin was at first the recipient of numerous pranks. However, the pranksters soon learned that the student best at herb lore and sleight of hand could place stinging nettles in the most unexpected places. Rasitlin studies at Theobald’s school for seven full years before casting his first spell. This is normal on Krynn. Magic is difficult and tiring even for the talented. After seven years of schooling, any students whom the master deems promising are given their first test of spell casting. They are taken to his laboratory, seated at a stone table, and told to scribe a scroll with the words, “I, Magus.” If the words glow brightly upon their completion of the scroll, the student enjoys further study. If the words do not glow, the student is sent home and secretly observed lest he join the renegade wizards. Raistlin takes the test with two other students. Gordo’s scroll merely sits on the table (he crossed out a misspelling, invalidating the scroll). Jon Farnish’s scroll glows gently but brightly. Raistlin’s scroll, however, does nothing—at first. Nervous and embarrassed, Raistlin prays to the gods of magic that if the three cousins will grant him the power of wizardry, he will serve them all his life, bring others into the craft, and glorify them. To the astonishment of all in the room, the Sly One’s scroll bursts into flames! When Theobald reports this to the conclave of wizards, Par Salian knows the sword he needs is being tempered and forged. And forged he is. Raistlin has learned that what he first wanted magic for is not to be within his grasp. He wanted to become a good wizard, a beloved wizard, almost a benevolent dictator of magic. However, he has learned that he will never be loved by the masses. Magic, even good magic, frightens them too much. He still intends to do them good, but now his goal of helping others is because he believes himself to be better than those who cannot do magic. It is the only way he can have power over them. When he uses his herb lore to heal and comfort plague victims, he is proud they need him more than humbled that he can help. However, the pity he feels for the downtrodden and oppressed is never faked. At one point, Raistlin doubts a plan he has put in motion, but his memory of a young mother who has been bilked out of her meager savings and frightened beyond her wits stiffens his resolve to go through with the plan. Considered a novitiate wizard after passing the ‘I, Magus’ test, Raistlin is allowed to wear the same color robes as his sponsor, Antimodes. For those who have read Chronicles and Legends where he wore red and black respectively, Raistlin in white comes as a big shock. Theobald makes him an assistant teacher and gives him personal tutoring and advanced lessons. More years pass for Raistlin and Caramon, with Raistlin at once envying his brother and glad of his own abilities. The aging Theobald moves the school to town after a particularly bad winter. Raistlin continues to study for another seven years, careful to break the rules no more than Theobald’s temper will allow. The complexity of Raistlin comes through in the next sections, and Margaret Weis has a wonderful gift for describing a scene. Raistlin and his companions travel to Haven for a festival. When they arrive, Raistlin discovers a renegade wizard exploiting the poor people in the small city. Raistlin, while he has no love for the people themselves as they hate wizards, pities them for how the wizardess is playing them. Raistlin breaks the rules of the conclave to expose the fraud. He confronts her openly and then casts spells far above what his training should allow. To Raistlin’s surprise, when the Conclave of wizards hears of this, they do not punish him. They invite him to take the final Test of wizardry. If he passes, he will be a full wizard, no longer a novitiate. If he fails, he will die. He may refuse the Test but will never be offered another opportunity. Raistlin and Caramon go to take the Test. I will not tell you the details of the Test save that Raistlin learns more of magic and even more of himself in the Test. The Test is not just to determine a wizard’s skill but what kind of wizard he will be. It is a time of great personal epiphany. Arrogantly, Raistlin thought he knew himself completely. What he learned of himself in the Test surprised him and all the observing wizards save Par Salian. Yet even the great Par Salian felt surprise at the extreme degree of Raistlin’s actions. But Par Salian was satisfied. He had his sword. You don’t have to be fan of DragonLance to enjoy SoulForge. Since the character is so young and in training, many things are explained to him that would otherwise require a fan of the series. The hat tips to the fans are present but subtle. I heartily recommend The Soulforge to all fans of DragonLance and to all fans of fantasy. The worldbuilding is solid and the way the author loves the main character and setting shines through. Even though you know how it will end, the journey is satisfying. You feel Raistlin’s struggles both within and without. For fans, you see how Raistlin came to be the way he is Chronicles. Nonfans may find themselves wanting to read Chronicles and Legends just to see where the forge has taken Raistlin.